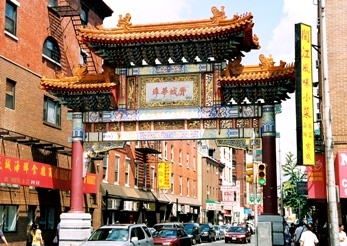 Just a short walk from Philadelphia's historic district is Chinatown. Covering an area from 9th to 12th Streets and Arch to Vine Streets, Chinatown is the heart of Philadelphia's Asian community since the mid 1800's. This area is a destination for Asian restaurants and markets. Chinese, Vietnamese and Thai restaurants are abundant. Additionally, Malaysian and Burmese cuisine can also be found here. Asian art and gift shops are also found in Chinatown. Chinatown is famous for its restaurants. The first restaurant Mei-Hsian Lou opened in 1870. Szechuan, Mandarin and Hunan cuisine are all readily available. In addition there are Vietnamese restaurants, Burmese, Japanese and Thai restaurants as well. 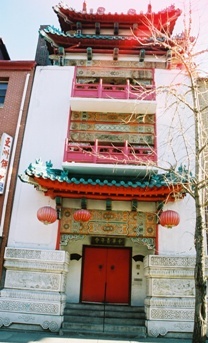 This many-colored arch decorated with fire-breathing dragons and Oriental lettering was a joint project between Philadelphia and her Chinese sister city Tianjin. Chinese artisans completed the Friendship Gate in 1984 with materials brought from Tianjin.